SAN DIEGO — Have you discovered the culinary bounty of the Ensenada region – its restaurants, taquerías, wineries and craft breweries? One of the things Arv and I enjoy so much about living in SoCal is that it’s a relatively short run, by boat or car, to Ensenada, a delightful, tranquil town which, along with nearby Tijuana, is the epicenter of the Baja gastronomic revolution. Many Tijuana star chefs, including Javier Plascencia and Miguel Angel Guerrero, originator of Baja-Med cuisine, now have restaurants in Ensenada or the nearby Guadalupe Valley wine region. Often, when we take our boat to Ensenada for a week or more, we’ll take the bus (actually, a motorcoach) back to the border, the trolley to San Diego and pick up our car before returning to Ensenada. That gives us maximum flexibility to explore the region. Recently I was delighted to meet Scott Koenig, a fellow Mexico fan and foodie who runs the website A Gringo in Mexico, filled with insights about Mexican culture, travel and food. I often check his postings and newsletter (sign up at agringoinmexico.com) whenever I’m seeking new dining experiences in Baja. 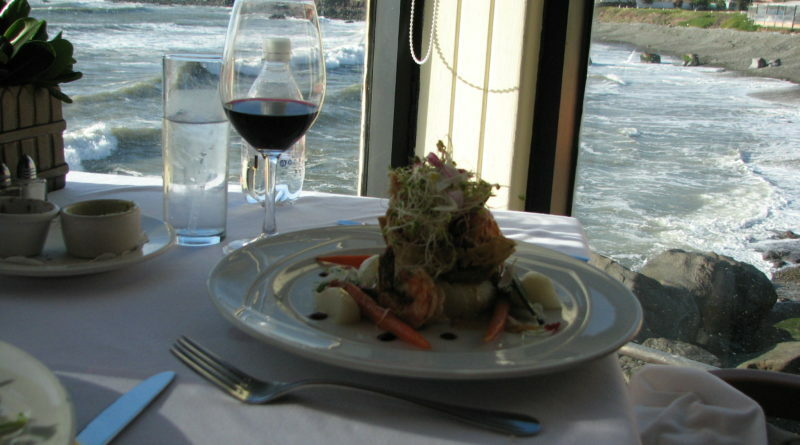 Since he visits Baja frequently, I gave him a call to compare notes on regional restaurants. While we share some preferences, each of us had recommendations new to the other. “Ensenada,” he explained, “is currently my favorite place,” chock full of great restaurants offering both street food and upscale dining, which remains generally casual. If you’re docked at Cruiseport Marina downtown, there’s a wealth of choices within easy walking distance. Scott’s top choices, all featuring great local seafood, include the internationally renowned taco and ceviche bar La Guerrerense (Av. Adolfo López Mateos 917), owned by Sabina Bandera and Eduardo Oviedo, and their nearby recently opened sit-down Restaurante Sabina (Av. Adolfo López Mateos 993), which features many of the same seafood dishes. Try also Muelle 3 (Av. Teniente José Azueta 187), a small seafood eatery near the Malecón started by now-celebrity chefs Benito Molina and wife Solange Muris. Their restaurant Manzanilla, located down the street at No. 139, goes beyond seafood and was one of the first casual “fine dining” spots to open in Ensenada 18 years ago and remains among the city’s best. Scott also recommends Tacos Fénix (Espinoza 451), which claims to be home to the original fish taco and is now, he explains, “a hipster taco place,” and the “very good” Boules (Calle Montezuma 623), also featuring seafood. More traditional, consistently good French/Mexican/international fare is available at one of the city’s oldest restaurants, founded in 1947, El Rey Sol (Av. López Mateos 1000), which serves its extensive menu on its sidewalk patio and its beautifully tiled dining room. Along the shoreline and on Mexico 1 highway – closer to the Coral Hotel & Marina – are several of well-loved spots for more upscale but still affordably-priced casual dining, the laid-back Ophelia’s (km 103.5), the spectacularly sited Punta Morro (km 106), which sits atop sea-washed rocks, and Sano’s Steak House (km 108), owned by the Hussong family, all offering varied menus and delicious food, with local wines and craft brews. Don’t miss visiting the nearby Guadalupe Valley, which now boasts exciting restaurants and great wineries, mostly located along the Ensenada-Tecate Highway, Mexico 3. Scott’s choices include Javier Plascencia’s Finca Altozano (km 83), Deckman’s at El Mogor (km 85.5), Corazón de Tierra (at La Villa de Valle off Mexico 3), Miguel Angel Guerrero’s La Esperanaza (km 73.5) and the pioneering Laja (km 83), one of my enduring favorites. Be sure to check out the restaurants’ reviews and websites. Whatever your food preferences you’ll find Ensenada offers outstanding fare.